RunCore introduced the InVincicle, a new SSD with a physical self-destruction mechanism, and the XAPEAR, which allows for complete remote data deletion via your cell phone. 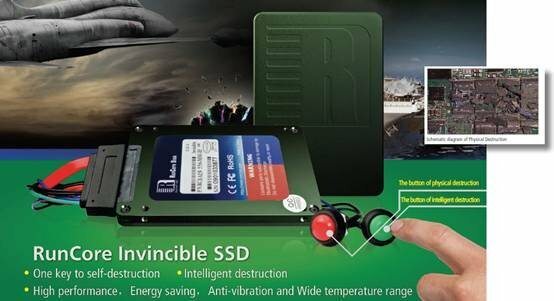 RunCore, leading supplier of high-performance solid-state drives, has just started giving a sneak preview of two soon to be globally available special-use SSDs, the RunCore InVincible with a physical self-destruction mechanism, and the RunCore XAPEAR, allowing for complete remote data elimination through your mobile phone. With these devices your private data protection is entering an entirely new stage of security. This is especially important in an ever more mobile environment were sensitive data and information are frequently being caring along, making it a potential risk to being used by unauthorized 3rd parties. With the RunCore InVincible and the RunCore XAPEAR you now have a highly advanced data protection solution, even for the private sector.